It's easy to order a cover that fits your spa perfectly! Do you hate the color of your current spa cover? Think you can't get a replacement cover for your older spa? You’re Living the Spa Life. craftsmanship, 5 years pro-rated against water absorption. We can make an insulating spa cover for YOUR spa regardless of its brand or age! heat retention and water runoff. The cover incorporates a keyed lock for safety and the cover’s materials and construction are carefully tested and certified by an independent laboratory. Inside and outside handles make managing the cover easy. A good spa cover saves you money, since they reduce energy used. It also reduces maintenance costs, since your spa doesn’t have to work as hard to stay warm between cycles. And don’t forget about safety — many a locked-down insulated spa cover has prevented a pet or child from falling into the spa. We think you’ll agree, it’s worth every penny. 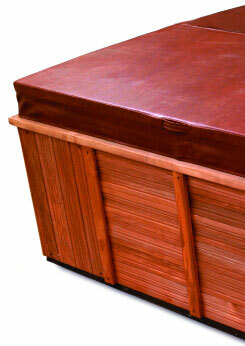 It’s easy to order a cover that fits your spa perfectly! Once you select your cover shape, you can download a form that will help you record the measurements. But even without the form, you can take a pencil and tape measure to your spa, measure all the places it suggests, and write the measurements down for reference. This is your chance to get a cover that fits perfectly, so careful measurement is important. Next, choose a color from the selection you see here. If you know your spa brand and model number, that can also help, since we have many spa measurements on file at our cover-replacement center. If you need help, just call our customer service team at 1 (800) 393-3399 and we’ll be glad to help you with your custom cover order. Within 2 weeks, your new spa cover will be delivered — and you’ll love it.